Daniel Ernest Hall, age 45 of Fort Scott, Kan., passed away on Saturday, Sept. 8, 2018, at Mercy Hospital, following a battle with cancer. Danny was born in Fort Scott on April 29, 1973, to Ernest Hall and Patricia Goltra Hall. He married Amanda Cowen on Nov. 30, 2002, at Community Christian Church in Fort Scott. He graduated from Bolivar High School in 1991 then received a bachelor of science degree in biology and education from Pittsburg State University. 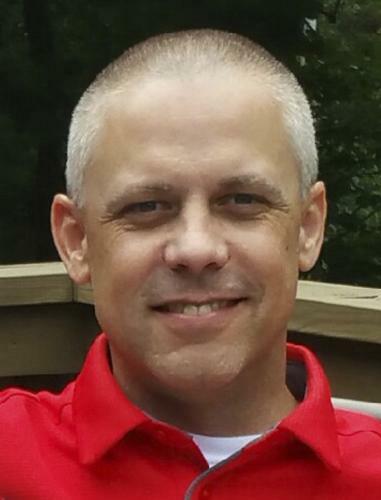 He began teaching biology and coaching in Bolivar in 1995. He then taught and coached four years in Frontenac High School. Danny thoroughly enjoyed coaching football. Leaving education, he pursued his first dream in the medical field. Danny began as an EMT for the Linn County Ambulance Service. Danny received his paramedic licensure from Johnson County Community College. In 2015, he was awarded the White Stars of Life from the American Ambulance Association in Washington, D.C., for ambulance professionals who have gone above and beyond the call of duty in service to their community. Danny most recently served as the EMS manager for Mercy Hospital of Fort Scott. Danny was an active member of Community Christian Church where he attended for 16 years. His hobbies were deer and turkey hunting, carpentry, golfing, target shooting, archery, KU basketball, and watching the Kansas City Royals and Chiefs. Danny enjoyed spending time with family and friends during special holidays and events. Christmas was Danny’s favorite holiday. Surviving are his wife, Amanda, and two sons, Cole and Caleb; and five sisters, Denise Patton (John) of Osage Beach, Mo., Christie Hilton (John) of Manassas, Va., Stephanie Myers (Jake) of Morrisville, Mo., Laura Hall of Bolivar, Mo., and Erin Hall of Springfield, Mo. Preceding him in death were his mother, Patricia Goltra Hall, and his father, Ernest (Ernie) Hall; and grandparents Robert J. Goltra Sr., Ernest Bernard and Eileen J. Hall. Rev. Dusty Drake and Rev. Mike Armstrong will conduct funeral services at 10 a.m. Thursday, Sept. 13, at the Community Christian Church, 1919 S. Horton, Fort Scott. Burial will follow in the Evergreen Cemetery, Fort Scott. The family will receive friends from 5-7 p.m. Wednesday evening at the Cheney Witt Chapel. Memorials are suggested to the Cole and Caleb Scholarship Fund and may be left in care of the Cheney Witt Chapel, PO Box 347, 201 S. Main, Fort Scott, KS 66701. Words of remembrance may be submitted to the online guestbook at cheneywitt.com.